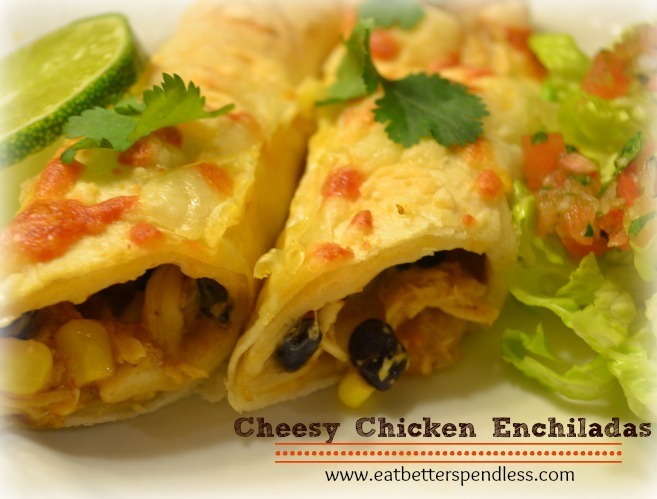 It took me a long time to find an enchilada recipe that I felt like I could keep on my meal plan and that I could share. I had one that we liked but it included cheese from a jar. I just don’t feel great about serving my family cheese in a jar. I wasn’t sure how to get the creamy texture without it. But I have since found out. It’s kind of embarrassing. It’s called… cheese. Just cheese. Not from a jar, and no need for “cream of this or that soup”. Just good cheese. I love these enchiladas because of their flavor, the affordability, and most of all because it’s super easy to make a bunch and they freeze exceptionally well. Ready to fill your freezer with good food? Using the pan you will eventually cook your enchiladas in, line the pan with foil. Let the foil drape over the sides. When you’re done, you’ll fold the edges up over the enchiladas and remove the whole package from the pan. Then you’ll use the pan again for the next batch. This way, you’re not taking up as much space in the freezer and you’re not tying up your pan in your freezer. Mix all ingredients (except the cheese you’re saving for baking time) in a large bowl. 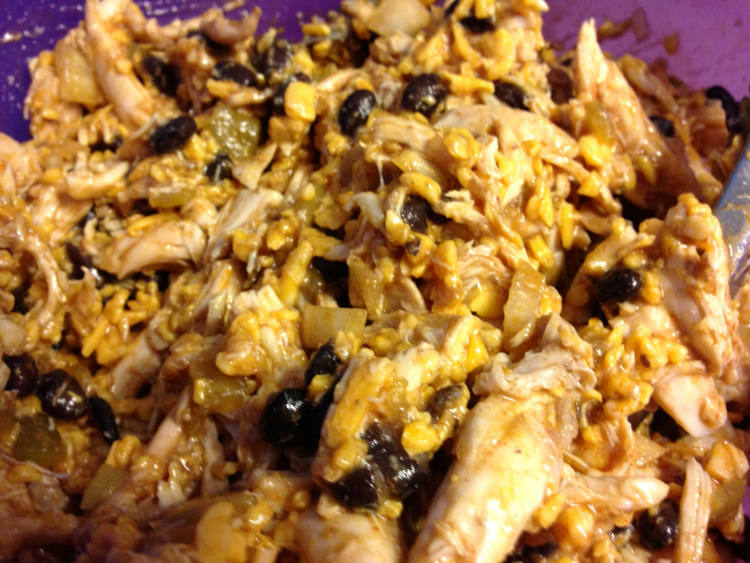 For the chicken I used my Pulled Chicken, and for the cheese I used my Three-Cheese Mexican Blend. I might find a recipe to make my own enchilada sauce. If I do, I’ll come back and add that here. Lay a tortilla on your work space and put about a cup of filling toward one end. Spread it so it almost touches the sided. 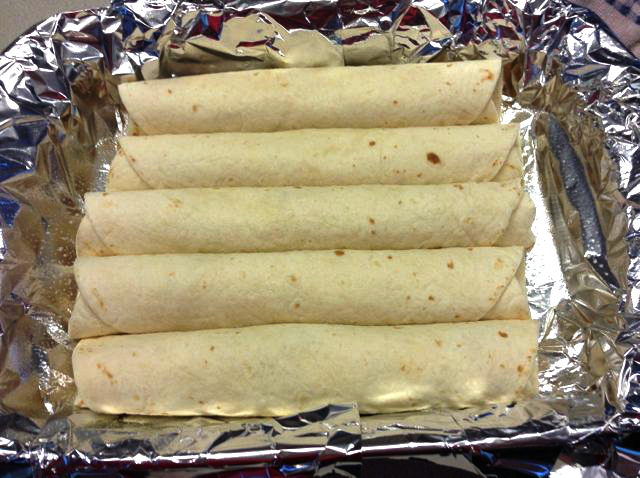 Roll the tortilla tight and place in your casserole dish. Keep going until your pan is full. Now just take those pieces of foil and fold them in over the top of your enchiladas. This picture doesn’t show it, but once I folded the left side over, they were completely covered. I’ve thawed them in the fridge, and I’ve cooked them straight from the freezer. Bothe ways are fine. I tend to just throw them in the oven at about 375° and come back about a half hour later. Here’s what went into the freezer, plus we had one batch for Sunday lunch the next day. There’s just nothing like leaving church knowing that lunch is all cooked! Don’t forget to label it. At least remind yourself what it is. And maybe some cooking directions would be a good idea. 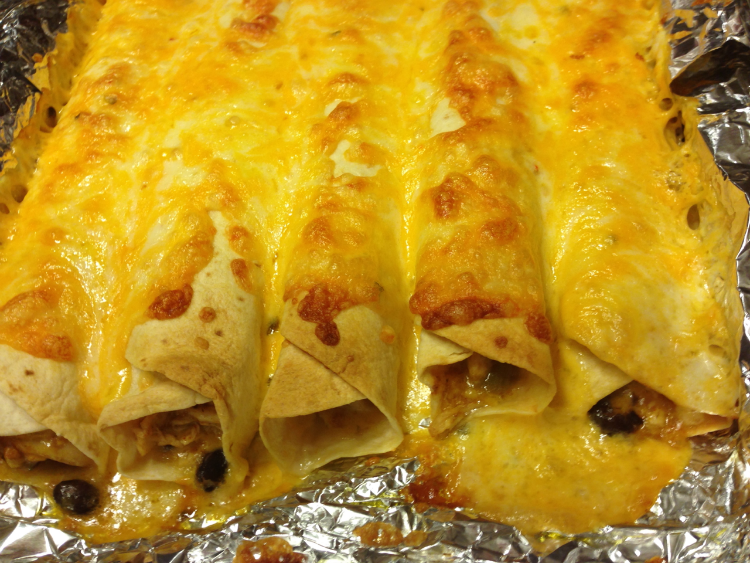 You can add more enchilada sauce to the top when you cook them. That’s what my label in this picture says. But, I have to confess, that when we took these out of the freezer and cooked them, I didn’t have more sauce. So we just used cheese and it was totally good. So, maybe it’s better to just leave it at that. I love to let the edges get crispy. Don’t worry, the inside is still creamy and yummy! 1 small can green chills (opt). This is a large batch, so we'll make these for the freezer. 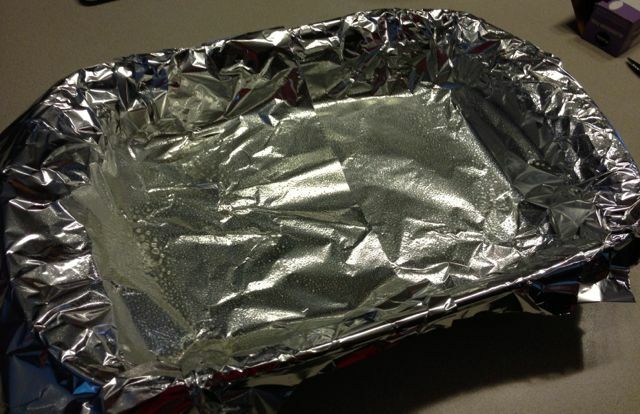 Line a casserole dish with foil, leaving enough foil to fold over the top of the enchiladas. Spray the foil lightly with cooking spray. Mix all ingredients except the tortillas in a large bowl. Lay a tortilla on your work space and put about 1 cup of filling toward one end. Spread the mixture so it almost touches each side. Roll the tortilla tightly and place in the pan. 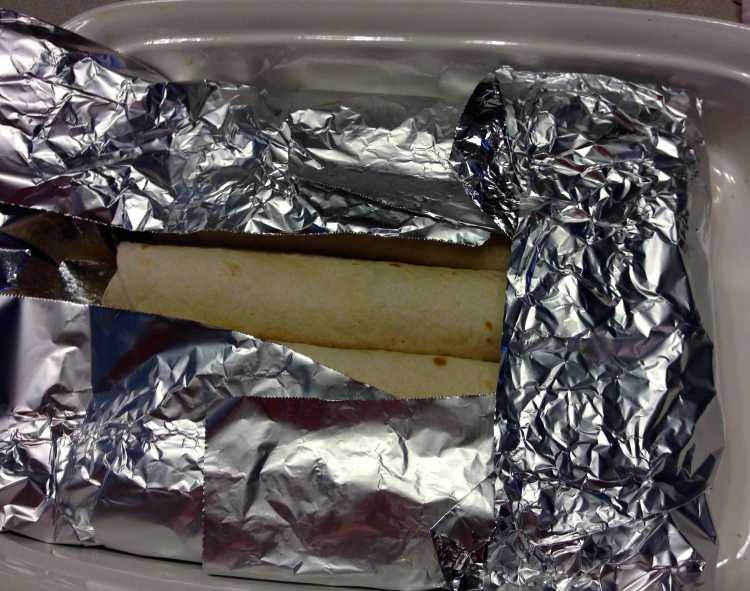 When the pan is full, fold the edges of the foil over the finished enchiladas. You can now remove the enchiladas from the pan so you can use it for the next batch. 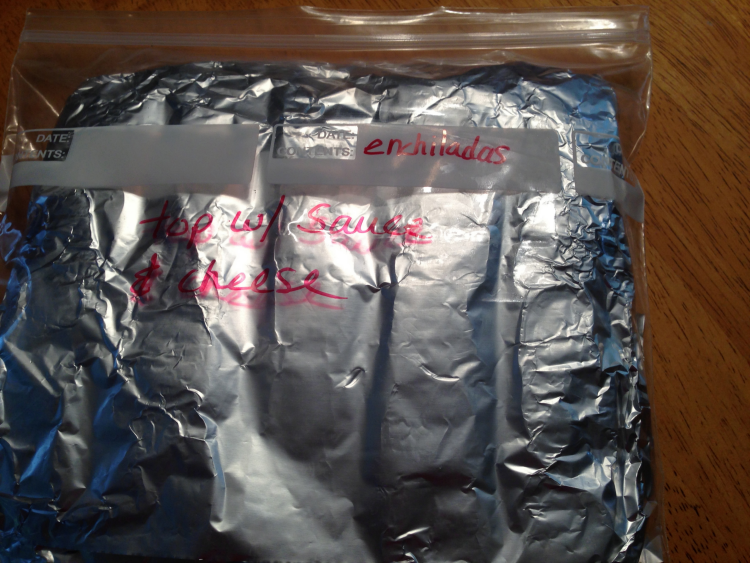 Measure out about ½ cup of your cheese mixture and place in a freezer bag. 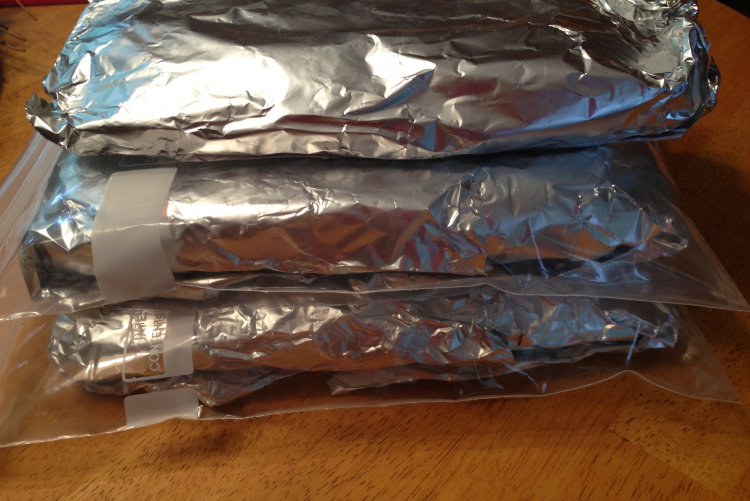 Wrap the enchiladas (which are now wrapped in foil) in plastic wrap. Place the bag of cheese on top and put a large rubber band around them both. To prepare, thaw in fridge overnight. Top with the cheese and bake on 375° for about 25 minutes. Just wondering . . . you don’t have any worries about the effects of cooking with aluminum foil? I mean, the whole Alzheimers things, you know? I’ve always avoided aluminum for this reason but would love to believe that it was safe. Honestly I haven’t really looked into it in detail. I use it so seldom I’m really not concerned. I also think it is more of a concern for things that will be in contact for a long time as well as foods that will leach the aluminum, like maybe tomatoes. But, you can totally make this recipe without it. just freeze them in a plastic bag (of course there are folks out there who won’t use plastic either) and bake them in a casserole or cake pan. Thank you so much for your reply. I have so many things I’m paranoid about. Just trying to let go a bit. I appreciate your website. Many blessings to you. I figure worry and stress present more of a clear and present danger than half of the stuff I’m tempted to worry about, so I try to relax a little. I’m so glad you’re enjoying the site! Blessings to you as well! Thanks! I’m sure you are absolutely right! My husband has been trying to tell me this for years. Hey there! Have you used this recipe for halibut? Nope, sorry, I sure haven’t. If I did though, I think I wouldn’t mix the fish in with the rest of the mixture. 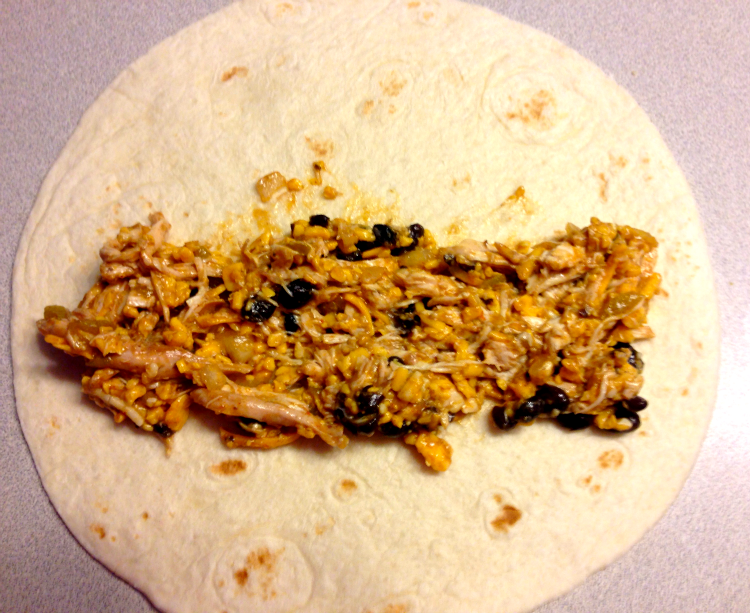 I think I’d spoon some of the mixture on to the tortilla, then the fish, then roll it up. Seems like that would help the fish maintain it’s integrity and not get lost in the mix. I’d love to hear back from you if you try it. Send us a pic! Sure will – thanks for the suggestions! do you think a tomatillio sauce would work for this? Honestly, I’ve never used tomatillo sauce. I would think it would be good though. It probably wouldn’t be the same, but still good.